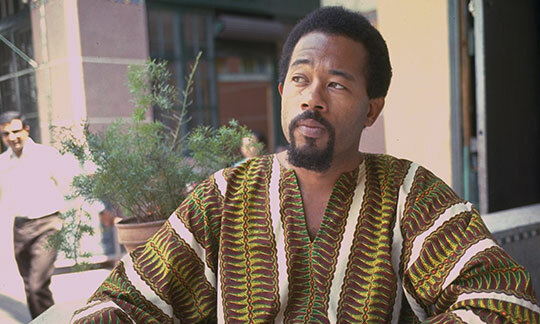 Elaine Mokhtefi talks to Jeremy Harding about her memoir of Eldridge Cleaver and the Black Panthers in Algeria, published in the LRB. Jeremy Harding: Welcome to the LRB podcast, I’m Jeremy Harding and I’ll be talking to Elaine Mokhtefi. Elaine’s memoir about Eldridge Cleaver and the Black Panthers in Algeria, who pitched up at the end of 60s, was published recently in the LRB. It tells the story of an extraordinary encounter between the leader of a radical movement forged in the heart of empire and the new regime in Algeria that came to power after a long and bitter war with France. In 1962, independent Algeria became a patron of Third World struggles, an African Cuba, and it took its mission seriously. It invited national liberation movements to open bureaus in Algiers: the Vietcong, the Southern African anti-colonial and anti-apartheid organisations, the Palestinians - the list was long and illustrious. It even offered military training. But when the Black Panthers showed up, nothing was straightforward. Elaine Mokhtefi was living and working in Algiers at the time. She helped Cleaver find his feet, and she welcomed the Panthers. Most of what followed she saw at first hand. Her sympathies lay with the liberation movements, and the exiled radicals from the United States. But she was in those days a cautious supporter, with reservations, of the new Algerian regime; and hardly surprising, she was a long-standing critic of French colonialism. Elaine Mokhtefi: Colonialism, whether it be French or anybody else’s colonialism, is an abomination, and it’s a war that lasted for almost eight years, which is a black mark on French history that’s not easy to erase. JH: When you took up the post in New York, what were your politics at the time. Apparently you were on the left, but that’s not exactly clear to us now what being on the left meant at the time. EM: What does it mean to be on the left in 1960? I had worked mainly with organisations that were interested in human rights and world peace. Back in the United States, my first real political activity, I guess, was working for world peace through world government, with an organisation that was quite representative at the time of thinking on the campuses and in liberal circles. JH: Everything felt new and a lot of things felt possible after the end of World War Two? EM: Well, yes we did. We were enthusiastic, but very quickly our hopes were dashed with McCarthyism and the backlash against political organisations that had human rights as their goals and world peace. JH: I mean, as you looked around at the end of the 50s and early 60s, there were – I wouldn’t call them beacons – but there were prospects for people who believed in a global renewal. There was Senator J. F. Kennedy, for example, who did express an interest in Algerian independence. EM: Yes, Kennedy made a speech on the Senate floor in, I guess, it was ’56, condemning Eisenhower’s politics with respect to France and Algeria. He accused Eisenhower of coming up with policy with his head in the sand, providing armaments that was supposed to be for the NATO countries that he knew very well France was using in Algeria. And that speech had tremendous impact, in fact Kennedy said at the time that he’d never received so much mail as he did following that speech. In 1960, when he was running for president, the Algerian office where I was working tried to get him to reiterate that statement, and he refused at the time. He was campaigning and he didn’t want to get involved in that sort of politics. His brother did say that JFK was still behind his earlier statement but he never made it public. JH: Algeria had become a delicate subject by then. When you set off to New York to work for the reps of the Algerian government in exile, you had already encountered some of them elsewhere when you were in West Africa running a youth congress. One of them was Frantz Fanon. I just wondered, he and his colleague were there and you had quite a lot to do with them, everybody now has quite a vivid, strong impression of Fanon through his writings on politics and his work as a psychiatrist in a colonial nightmare. What were your own impressions of him as a person? EM: He seemed to me to be a man who was driven – his ideas were his life, and his ideas were both in the field of psychiatry and in the field of African and world politics. He was a revolutionary in both his personal life and his public life. JH: Did you have much to do with him after you’d met him at the congress in Ghana? EM: Yes, I did meet him again in the United States when he had leukemia and came there to be examined at the Bethesda Hospital of the US government outside of Washington. He had been to the Soviet Union at the time, earlier, and had been treated and he thought that he was on the road to recovery but very quickly the leukemia caught him up again and at that point even the Soviet doctors thought that he should try American medicine to see if there was anything that could be done. The Algerian provisional government sent him to Washington and I happened to be the only person who had ever met him before from our office in New York so I often went down to see him and see if he needed help, needed anything, was being treated properly. So I got to know him quite well. JH: People tend to forget what a beacon Algeria had become for Third World countries and non-aligned members. It was a kind of African Cuba when you went there. After independence in ’62 you were invited to work for Ahmed Ben Bella, the new president, in his press and information service, and you took up the offer. Can you say a little about what Algeria was like when you pitched up? You write in your memoir for the LRB that it was a capital for the liberation movements in Africa and Asia – the ‘Third World’ as we used to call it. Tell us something about that bustling, radical scene as you encountered it. EM: Well, first of all there were lots of offices being occupied by representatives of liberation movements. In addition to which the Algerian government was training soldiers of these liberation movements, giving them military training. And opening the press to them, helping them with public relations and interviews. The radio and the newspapers were open to them. I don’t know how many liberation movements had representation in Algiers at the time. It was really wide open not only to African movements but even opposition movements from Portugal and Spain. I once met a member of the French-Canadian liberation movement. There were people who say there were as many as 70 organisations represented. I think it’s an exaggeration, but there were a great many. EM: Of course, there were the Vietnamese – the Vietcong, had a big office in Algiers and was very well represented by a very competent man, Trần Hoài Nam. He was an old time militant, who was one of the few representatives of liberation movements who got very close to Algerian leaders personally. He was an amazing man. And there were of course all of the Palestinian organisations represented. There were opposition movements from Morocco and Tunisia, Algeria’s neighbours. The country was really open to Third World politics at the time. JH: How close did Ben Bella allow the staffers in his office to get to him? Do you feel you got to know him at all? EM: No I don’t feel I got to know him at all, really, because we were a completely separate unit in what’s called the Palais du Gouvernement, the Government Palace, whereas he was set up in another part of town in a villa called the Villa Jolie. No, I didn’t get to know him. I worked under the direction of one of his close counsellors. JH: So you didn’t really have much of a sense of him, but what did you make of him as a figure? Were you an admirer? EM: I did in the beginning – I admired him considerably. As time went on, I become much more disillusioned. I attended a few public meetings where he was very outspoken against individuals, where he made promises that couldn’t possibly have been kept. He was a good speaker and very convinced of his capacity to lead the country. I don’t know how well he took advice and listened to the people around him. But one of the main things that was very troubling was that torture began again in Algeria, but this time, Algerians on Algerians, and it was allowed by the Ben Bella regime. JH: So who was being detained and tortured and for what reasons? EM: Opposition characters, opposition politicians, heads of opposition organisations, being taken in and secretly tortured. JH: And was this common knowledge? You say ‘secretly’, but did the word get around? EM: Oh, the word did get around. We even knew the name of the villa where this was happening. JH: Ben Bella was overthrown in a coup in ’65, and he was replaced by Houari Boumediene and a kind of entourage of Boumediene’s comrades from the Army of National Liberation. Had you seen the coup coming? EM: Actually no. It was rumoured for a week or two before the coup came about that there was a strong misalliance and that there was trouble brewing between Boumediene, Bouteflika and Ben Bella, and that rumour got around to such an extent that it got into the press in the last few weeks, and maybe even the day before the coup Ben Bella made a speech in which he said that he and Boumediene got along beautifully, like two fingers of the hand. The next day, it was over. JH: I guess, because you’ve already voiced your reservations about Ben Bella before he was overthrown, that you weren’t too uneasy about continuing to work as a member of the Algerian Press Service now that Boumediene and the new regime had ousted your former employer and put him in jail? EM: Yes, well, I had adopted Algeria, in a sense, as my future, and, good or bad, rain or shine, I was sticking with it and continuing to work, because there were so many positive things happening at the time. International meetings of Third World groups, there was a struggle against imperialism on a world level and Algeria was a strong part of it. So, it was meaningful to be there and felt that I was part of a movement and it didn’t occur to me to leave. JH: I was casting around on the internet before we started talking for the date that Gillo Pontecorvo began shooting The Battle of Algiers, and the best I could come up with was the summer of ’65. And apparently the shoot took several months. But that would mean that he was filming in Algiers when the coup took place in June. Is that the case? EM: I think they had just packed up and gone. I do remember the morning of the coup, I drove to my office at Algerie Press Service, through the main streets of the city, and I saw the tanks parked here and there, and I remember thinking that this was all very strange, and a lot of us thought that perhaps this was décor for Pontecorvo’s movie The Battle of Algiers. But we very quickly realised during that same day that of course it wasn’t décor, it was a real thing. Tere’d been a coup d’etat. JH: Do you think the film was an accurate representation of what Algerian’s recall about the struggle in Algiers, in particular, and the crimes of the French, or was it just doctrinaire puff intended for European sympathisers on the left? EM: I think that they got a good taste of it, the struggles in the Casbah, the determination of the French to put down the revolution, the means they used – murder, execution of prisoners, torture, and so on, I think we get a good feeling of it through that film. Yes, and of the courage and the need to fight on the part of Algerians, I think it’s got a good flavour to it, yes. JH: Somehow the left in the west only got a part of what was happening in Algeria during the war and afterwards. Maybe they failed to see how conservative some elements in the anti-colonial movement really were. I’m thinking of the Islamic strand. The Muslim clergy and their congregations. That was kind of downplayed – that’s the view of Mohammed Harbi, the historian, who I know you know. I wonder if there’s any truth in it? EM: Yes, I think it was definitely downplayed. I think Harbi was right that it was downplayed. But we felt it coming, I think that we sensed that the reliance on teachers and preachers coming from Egypt and other Islamic countries was not going to have a positive effect on the education of children and on the adherence to a more liberal view of religion. On the contrary. Yes, it was obvious. JH: This was happening actually after independence? That there were actually invitations to imams to come and work in Algeria? EM: Yes, this was after independence, and you could gradually see the Ministry of Habus, which is the religious ministry, now beginning to organise different conferences, and you could feel the strength of their moves, but also you could feel the acceptance on the part of more liberal elements since they did not react. JH: They didn’t react because they were apprehensive in some way, they didn’t want to cause a stir? What was the reason? EM: Intimidation, I think. They were intimidated, and gradually the religious elements took on more and more importance, and were more and more audacious. JH: Four years after the coup, the Black Panthers arrived in Algiers, or rather, Eldridge and Kathleen Cleaver. They come from Cuba. And your story of their time in Algeria is absolutely gripping. How did you first encounter them? Could you remind us of that? EM: One night as I came home very late, around midnight, I could hear the phone ringing in my apartment, and I ran to open the door, and it was Charles Chikerema, who was the representative of the Zimbabwean African People’s Union in Algiers, and was a good friend of mine. And Charles was on the phone saying Eldridge Cleaver is in Algiers and he needs help, go see him. So he gave me the name of a hotel and the next morning I went to that hotel, and it was a third rate hotel in sort of the no-man’s land between the Casbah and the European city, and I met Eldridge and Kathleen Cleaver. Kathleen was eight months pregnant and flat out on a bed, and Eldridge was towering and hit the ceiling with his head, and he told me a story, and he did need some help, yes. JH: Just run us through that story. EM: He had been living clandestinely in Havana, and had been discovered by a journalist, and the news hit the press and I think the Cubans were not happy, they had enough problems, they didn’t want another one. JH: When you say ‘clandestinely’, you mean, with the approval of the Cubans, but unknown to the rest of the world? EM: That’s right, it was unknown to the rest of the world. He was to keep a low profile. Very difficult for Eldridge. So at some point they told him that they had made contact with the Algerian Government and that the Algerians would be very happy to receive him and allow him to undertake his political activity, that he would be able to remain in Algeria. However, when he arrived the only person who was at the airport to meet was a representative of the Cuban embassy, who told him that the Algerians had changed their minds, and when Eldridge told me this story I couldn’t believe it. I’d never heard of the Algerians refusing to receive someone who needed help, was in exile, refugees were always welcomed at the time. I told him so and also told him that I knew the man who was head of liberation movements and I could contact him if he wanted me to. And he thought that would be a pretty good idea, so I did. And that was Commandant Slimane Hoffman, who was head of the sector of the FLN in charge of liberation movements. I called him a few hours later, and he said, right on, yes, of course, he can do an international press conference, he can remain here, no problem. JH: I’m going to get us to leapfrog over the story of Cleaver’s time in Algiers, it’s all brilliantly told in your piece for the LRB. In fact I’d call it required reading. But I do have two questions about that period. First of all, why do you think the Algerians could never bring themselves to give the Panthers formal recognition in Algiers as a full-fledged liberation movement? They had many of the trappings and also many of the privileges of the other movements, but they never quite got the full recognition out of the FLN, did they? EM: Yes, they did finally get it. They didn’t in the beginning. It took about a year or so. In the beginning they didn’t. I don’t know what the reasons might have been. I can imagine that there was perhaps some hesitation in confronting the American hierarchy, or the American government, however they did do it. After about a year we got in touch with some personalities in the Algerian set-up, who saw to it that they got not only recognition, but they got a villa, which was something quite rare among liberation movements at the time. They got recognition with a certain number of privileges, they got Algerian ID, they could come in and out of the country without visas, so could the people that they approved of. They got quite a number of privileges. They were advantages that not every liberation movement had. JH: So they were as recognised in the end as the PLO and the Zapu, the Zimbabwean movement, and the African National Congress and all the rest. EM: Yes, I think they got probably almost as much recognition as some of the Palestinian organisations. Except of course they did not get military training. That was not part of the deal. But they did get political enhancement, yes. JH: My second question is, what led Cleaver to leave Algiers? EM: Things were drying up. Not only with the Algerian authorities but in the United States with the organisation. The Black Panther Party had split and it was a very destructive time for the Black Panther Party as such, it was fading, definitely fading. So that he had a broken organisation in the United States, he had conflict with the Algerians – they wouldn’t have sent him away, but he realise that things were coming to an end, a period of history was coming to an end and it was time to move on. JH: Do you think that the split between Huey Newton and Cleaver was something that the Algerians read very carefully and felt that there was writing on the wall about the Panthers? How did they actually absorb that information about the Panthers being split and perhaps beginning to fall apart? EM: I actually wonder whether they paid much attention to it. I actually wonder whether they followed those things closely and attempted to interpret them. They were very far from understanding American organisations and American organisations of African Americans even less than anything else. I don’t think they followed it closely. And their policy in general with liberation movements was, let them do their thing, we don’t intervene. JH: Elaine, you fell in with a veteran of the Liberation Army, the Algerian Liberation Army, and you eventually married. Would you say a little about your relationship with Mokhtar Mokhtefi, because that’s something we don’t get in the piece. EM: Yes, Mokhtar had been in the Algerian Liberation Army, he was from some old town in central Algiers and he was a militant at an early age and joined the liberation army as soon as he could get into it. He was trained in the signal corps of the Algerian Liberation Army and spent I guess it was, of the eight year war I guess he must have spent five years in the army, leaving it only on the day of liberation. After independence he went to work in the Algerian government set-up in different positions. He also continued his studies. He got degrees in sociology, economics, law and so on, and continued his fight for justice and equality and what more can I say? He was a wonderful man. JH: Did both of you feel that the revolution wasn’t going quite the way you would have wished it had gone? EM: Yes, he felt that it was going in a very bad direction, he felt that they were being ruled by people whose goals were power and not justice. JH: ‘Justice’ seems a bit of a big note to go out on, but not a bad one for all that. Elaine Mokhtefi, thank you.